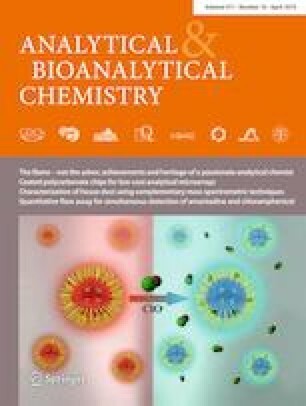 Presently, most reported electrochemical biosensors, for highly sensitive and selective detection of nucleic acid, still require multiple, time-consuming assembly steps and high-consumption DNA probes as well as lack good performance in human serum, which greatly limit their applicability. 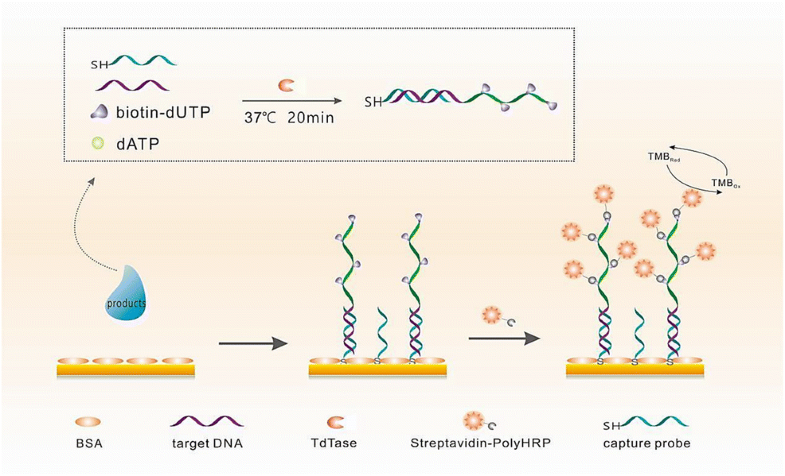 Herein, an easy-to-fabricate electrochemical DNA biosensor constructed by assembly of bovine serum albumin (BSA) followed with direct incubation of amplified products has been proposed. This method combined terminal deoxynucleoside transferase (TdTase)–mediated isothermal amplification and polyHRP catalysis to achieve dual-signal enhancement, and was featured with low-density DNA monolayer for its employment of only 2 nM capture probes. Surprisingly, based on the low-density DNA monolayer, the steric hindrance effect of polyHRP could effectively restrain the background compared with HRP, which further pushes the signal-to-noise (S/N) ratio to 70 than that of most currently available methods. Additionally, this strategy also showed favorable specificity and powerful anti-interference in human serum, and thus potentially attractive for diagnosis of diseases. Jinyuan Chen and Chenliu Ye contributed equally to this work. The online version of this article ( https://doi.org/10.1007/s00216-019-01637-0) contains supplementary material, which is available to authorized users. This work was financially supported by the National Natural Science Foundation of China (21775023); the Medical Elite Cultivation Program of Fujian Province (2018-ZQN-49); the Open Program for the Key Lab/Research Platform of the First Affiliated Hospital of Fujian Medical University (FYKFKT-201707); the Outstanding Youth Scientific Research Personnel Training Plan of Colleges and Universities in Fujian Province (2015B027); Joint Funds for the Innovation of Science and Technology in Fujian Province (2016Y9019); and the Special Fund of Youth Top-Notch Innovative Talents of Fujian Province (SQNBJ201601). This study conformed to the ethical guidelines of the Declaration of Helsinki and was approved by The Ethics Committee for Human Research, The First Affiliated Hospital of Fujian Medical University. Human serum samples used in this study do not have any identifying information about all the participants that provided written informed consent.